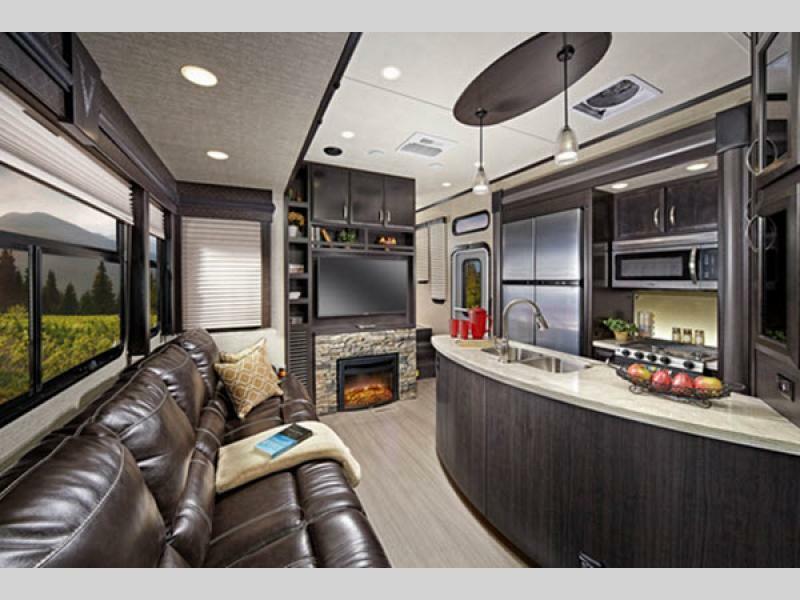 If you’re in the market for a new fifth wheel toy hauler that promises comfort, quality, and luxury, look no further than the impressive Dutchmen Voltage V4005. 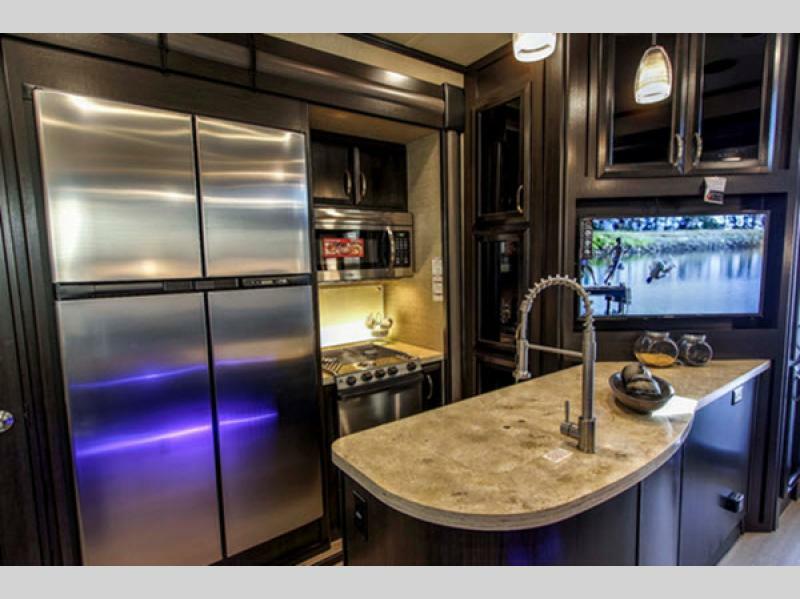 This gorgeous toy hauler offers the adventurous family room for up to 8 people, as well as a huge garage, bath and a half, and 30 gallon full station. Learn more in our Dutchmen Voltage V4005 toy hauler fifth wheel review. 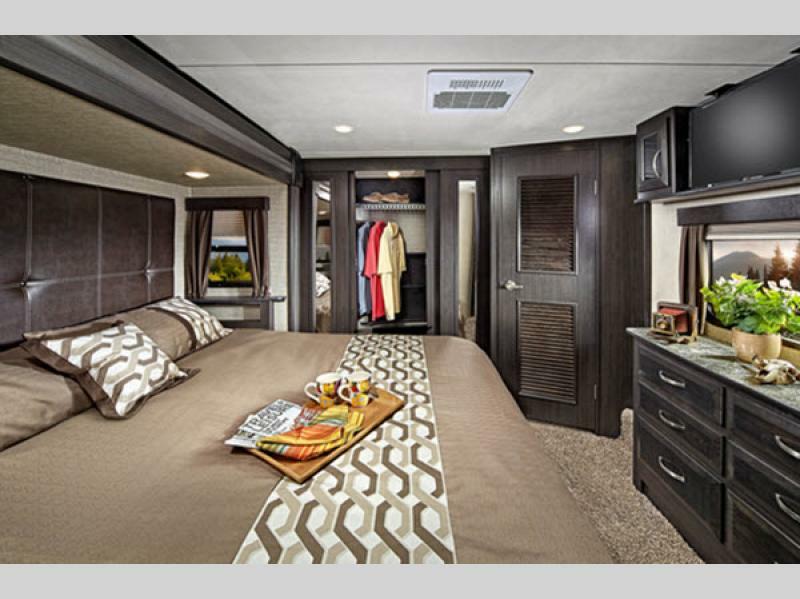 The giant bedroom found in every Dutchmen Voltage floorpan promises to provide you with privacy and comfort at the end of a long day. The lovely decor will make you feel right at home, while ample storage offers everything you need to bring all of your favorite items with you. Attention to detail abounds in this bedroom. From the plush carpet to the practical layout, every detail was designed with you in mind. Even the least enthusiastic person in the kitchen can’t help but get excited when they see the Dutchmen Voltage’s kitchen. it comes with everything you need and then some to create amazing meals for the entire family. And with the kids and maybe even some friends along for the ride, you’re going to find yourself taking advantage of this kitchen more often than not. When you aren’t hitting the trails with the kids or kicking up some dirt with your ATVs, you’ll love relaxing in the living room. From the entertainment center to the plush seating, each part of this space was designed so that you feel at home wherever you are. If you’re interested in learning more about our Dutchmen Voltage V005 toy hauler fifth wheel for sale, contact us. We’ll answer any questions you have, and, as your Kansas RV dealer, we can help get you set up for RV financing.